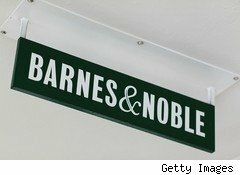 After a hotly contested and acrimonious proxy fight contest between Barnes & Noble (BKS) Chairman, founder and top shareholder Leonard Riggio and billionaire investor Ron Burkle, Tuesday morning's annual shareholders meeting promised to be an entertaining affair. And there were plenty of laughs and rambling comments, but in the end, the outcome was more fait accompli than 11th-hour surprise. And it served far more to raise questions than provide answers. A majority but less than half -- 44% -- of B&N shareholders elected Riggio, David Wilson and David Golden to the board of directors, where they'll serve until 2013. Only 38% voted for the trio of nominees offered by Burkle's Yucaipa Cos., which included Stephen Bollenbach of KB Home (KBH), Michael McQuary, and Burkle himself. Burkle's bid to change the current "poison pill" measure by upping the acceptable stockholding threshold from 20% to 30% was also voted down. When Riggio, who as chairman hosted and led the meeting, announced the news to a raucous -- and long -- round of applause, he said, "This has not been an easy four or five months. . .but this has been a very great day." Those among the 250 or so shareholders, media and other interested parties packing the Asia Society auditorium on Manhattan's Upper East Side might have realized something was up barely two minutes into the meeting. After brief introductory comments, Riggio asked whether any representative of Yucaipa wished to give a statement, which appeared to be their intention from their previous statements and filings before the meeting. But no one volunteered then, and no member of Yucaipa said anything during the Q&A session, which was full of florid and effusive statements about how much Riggio had meant to various employees and shareholders, many of whom had been with B&N for more than three decades. It didn't appear that Burkle was even present at the meeting. If he was, he was a very silent observer. High-ranking representatives of B&N, including CEO William Lynch and CFO Joseph Lombardi, reiterated key points they've been making to shareholders in letters and statements throughout the proxy fight: They expect over $7 billion in sales for 2011, and the digital side will continue to grow at staggering rates next year through 2014, when B&N expects to have greater than 20% market share of physical books and between 20% and 25% market share on the electronic side. In a news release, Yucaipa spun the proxy-fight loss by saying Riggio started with a "substantial" voting advantage, but preliminary tallies showed that "less than 50% of the outstanding stock voted for him and his slate of director nominees." After the meeting, B&N's Lombardi portrayed the vote a little differently: Take out Riggio and family-affiliated shares (around 36%), those owned by Yucaipa (a little less than 19%), and No. 3 stockholder Aletheia Research and Management (at about 16%), and the remaining stockholders voted with B&N's slate of directors by a 3 to 1 margin. On the surface, Burkle has been rebuffed. But in many ways, the outcome doesn't appear to change much. Yucaipa remains the second-largest shareholder, and it has appealed the Delaware Chancery Court ruling that affirmed B&N's "poison pill" measure -- which affects Burkle but not Riggio, who held more than 30% of total company shares before the measure was passed last November. Also, the board meeting hardly wipes away Burkle's existence. So, I asked Riggio how exactly the two sides could work together going forward, and if such a thing were even possible. "Let's first dispense with the assumption that large shareholders can't speak to each other," said Riggio, flinching a little. "There are also two new board members whom I've never met before the current board proposed them." He signaled to the long group of tables onstage where the board members had been sitting throughout the meeting. "These are a good group of people, and to have someone" -- meaning Burkle and Yucaipa -- "call them names is not a good way to start." Riggio expressed his irritation that no member of Yucaipa or Aletheia had ever meet with key B&N executives in advance of the stock spree that began in late 2008 and accelerated throughout 2009. "Any larger investors have the right to come in and speak to management. Not one of them asked for a meeting. None met with the CFO prior to amassing their huge shareholdings. It's like running a machine without talking to anyone." At that point, Riggio was ushered away, both to his next port of call and to ponder where Barnes & Noble goes from here. Also worth pondering: whether the circus atmosphere of the past few months will dissipate and let the company sell books of all stripes at a clip pleasing to investors and customers alike.